Intel officially introduces its new enthusiast platform, the Haswell-E processor and the X99 chipset. This new flagship processor series includes the Core i7-5960X, Intel's first eight-core desktop processor. An update to a motherboard with the X99 chipset is required due to Haswell-E's new integrated memory controller which introduces DDR4 support to the desktop platform. Three processors were revealed today, they share the LGA2011 v3 socket and all three chips have a 140W TDP.. The Core i7-5960X is a $999 sixteen-threaded eight-core processor with 3GHz core clockspeed, 3.5GHz Turbo, and 20MB L3 cache. Next is the Core i7-5930K, a $583 twelve-threaded six-core processor with 3.5GHz core, 3.7GHz Turbo and 15MB L3 cache memory. With a list price of $389 the Core i7-5820K is the cheapest Haswell-E chip but one major difference with the two more expensive versions is that this model has just 28x PCIe 3.0 lanes instead of 40. Other than that, this six-core, twelve-threaded CPU has a 3.3GHz core, 3.6GHz Turbo and 20MB L3 cache. 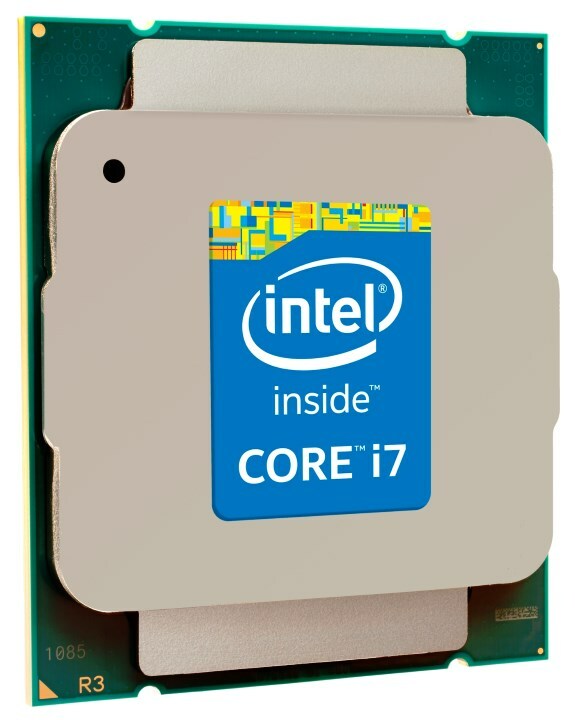 Intel Corporation unveiled its first eight-core desktop processor, the Intel® Core™ i7-5960X processor Extreme Edition, formerly code-named "Haswell-E," targeted at power users who demand the most from their PCs. For enthusiasts, gamers and content creators craving the ultimate in performance, Intel's first client processor supporting 16 computing threads and new DDR4 memory will enable some of the fastest desktop systems ever seen. The new enhanced Intel® X99 Chipset and robust overclocking capabilities will allow enthusiasts to tune their systems for maximum performance. "We're thrilled to unveil the next phase in our 'reinvention of the desktop' we outlined earlier this year," said Lisa Graff, vice president and general manager, Intel's Desktop Client Platform Group. "This product family is aimed squarely at those enthusiasts who push their systems further than anyone, and we're offering the speed, cores, overclocking and platform capabilities they have asked us for." At PAX* Intel is showing what these new, high-performance powerhouses can do. Intel's booth features systems from several manufacturers using this new processor family running popular games such as Lucky's Tale*, Superhot* with the Oculus Rift*, Dark Souls 2* and Titan Fall*. Additionally, Intel will demonstrate gaming while streaming via Twitch* on a new Intel Core processor Extreme Edition-based system. Live game streamers will enjoy having high-quality high-definition streams with eight cores for lag-less gameplay. Intel has been working with industry partners to take advantage of this new platform. Key OEMs, memory vendors, motherboard vendors and graphics partners will help grow this enthusiast ecosystem. "Alienware always prioritizes performance first and foremost in every system that we develop and we are constantly looking for cutting-edge technologies that can give our customers a competitive edge," said Frank Azor, Alienware* general manager. "It was an easy decision to work with Intel to bring its new eight-core extreme processor to our new flagship gaming desktop, the Alienware Area-51. Using new overclocking and monitoring features in Alienware Command Center 4.0, we've been able to really push the processors to the fullest extent and are seeing impressive overclocking headroom. This new Intel processor lineup is the perfect choice for gamers who demand the absolute best performance from their systems." "I'm ridiculously excited about Intel's new platform," said Kelt Reeves, president of Falcon Northwest*. "This is the biggest bundle of amazing new technologies all hitting at once that I can ever remember seeing. Enthusiasts will be amazed at what they can do with DDR4 memory, 10 SATA 6GB ports, 40 PCI Express lanes and eight-core CPUs." "Now is an exciting time for enthusiasts," said Harjit Chana, chief brand officer of Digital Storm*. "Intel's new line of enthusiast processors are breaking benchmark records. Featuring up to eight CPU cores and the new X99 chipset with DDR4 memory, our customers can now customize and buy the ultimate high-performance PC." "The new Intel Core i7 processors are a PC enthusiast's dream come true with up to 16 threads, faster speeds and cooler temperatures," said Kevin Wasielewski ORIGIN PC* CEO and co-founder. "ORIGIN PC's line of record-breaking desktops just got even faster." "Intel's new platform delivers the maximum processing power with eight cores of unstoppable processing power and supports DDR4 memory giving extreme gamers and demanding enthusiasts exactly what they need," said Wallace Santos, CEO and founder of MAINGEAR*. Many of these new platforms based on the Intel X99 Chipset are also Thunderbolt™ Ready. When paired with a Thunderbolt 2 add-in card, this enables a blazing-fast connection to your PC at 20 Gbps. Data intensive tasks such as 4K video editing, 3-D rendering and game development all strongly benefit from the performance of Thunderbolt 2. Check with your PC manufacturer or motherboard maker for compatibility. Three new SKUs will be available next week ranging from six to eight cores and from $389 to $999. These new processors are also conflict-free.